England captain Eoin Morgan won the toss and elected to field in the third and deciding one-day international against India at Headingley on Tuesday. England made one change to the side that won the second ODI by 86 runs on Saturday, with Hampshire batsman James Vince replacing Jason Roy after the opener suffered a finger injury while fielding at Lord's. India made three changes with paceman Bhuvneshwar Kumar fit following a back injury. Kumar and Shardul Thakur replaced fellow seamers Umesh Yadav and Siddarth Kaul, with batsman Dinesh Karthik coming in for KL Rahul. 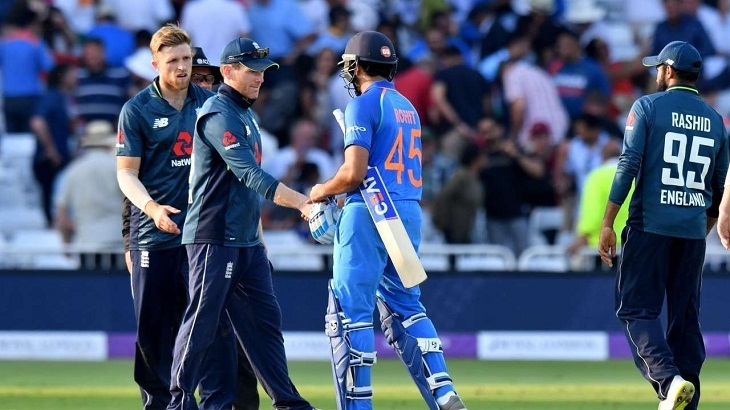 This three-match series was all square at 1-1 after India won the first ODI at Trent Bridge last week by eight wickets. India were bidding for their 10th successive bilateral ODI series win, with 2019 World Cup hosts England looking to treat Tuesday's match as the kind of winner-takes-all knockout match they will hope to play during next year's global showpiece event. For all England are number one in the ODI rankings, doubts remain about their ability to win knockout games at this level. England have never won the World Cup -- the most recent of their three losing appearances in the final was back in 1992 -- and their defeat by eventual champions Pakistan at Cardiff in the semi-finals of last year's Champions Trophy was their 13th loss in 19 knockout fixtures in one-day tournaments, the worst record of any major country.